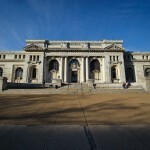 The Carnegie Library at Mt. Vernon Square combines simple elegance and modern amenities to create a versatile space perfect for any event. Located across the street from the Walter E. Washington Convention Center, this historic landmark has awe inspiring architecture, spacious rooms, a 150-seat theater and a grand exterior plaza. The Holiday Inn Washington, DC- Central/White House is a downtown Washington, DC hotel located only in walking distance to the Carnegie Library as well as the events and museums in Washington, DC. Take advantage of the hotel's premier location, which is within walking distance of the White House, monuments, museums, and the National Geographic Museum. Enjoy panoramic views of the city from the hotel's seasonal, rooftop pool and a full-service restaurant and lounge, the Avenue Cafe, where kids eat free.